Blast your opponent from a distance! The Tippmann 98 Sniper Rifle is the Ultimate Paintball Marker for Precision Shooting! Easy to use and super accurate paintball sniper rifle featuring the reliable Tippmann 98 Custom, high performance sniper barrel and top quality long range scope. If you’re tired of your paintball gun not quite reaching its target, consider the accuracy and range of a sniper paintball gun. Beware of guns that go overboard on the accessories, making them too heavy, cumbersome and overpriced. If you’ve never tried the sniper position, it’s best to learn the game without getting bogged down by the details of markers that are too technical. The Tippmann 98 Custom Sniper paintball gun is the perfect weapon. Simple and sweet, this gun is extremely accurate at much longer distances than the average marker. The Tippmann 98 Sniper Paintball Gun has been greatly loved by both beginners and expert players. Both groups praise the simplicity of this gun, yet sharp precision and sturdy reliability. Don't worry about the 98 Sniper breaking down on you in the middle of action; this marker is quality made and can handle tons of paint without mechanical problems. If you're a novice sniper on the field, the Tippmann 98 Sniper is an excellent starter paintball gun. This gun is super easy to aim and shoot, take apart, clean and maintain. Claim a distinct advantage on the tactical battle field when using the Tippmann 98 Sniper paintball gun. This .68 caliber marker is fully equipped with all the essential elements of an extremely accurate sniper paintball gun. Everything about the accessories on the Tippmann 98 Sniper add to this gun's ability to accurately hit targets much farther than the average paintball gun. 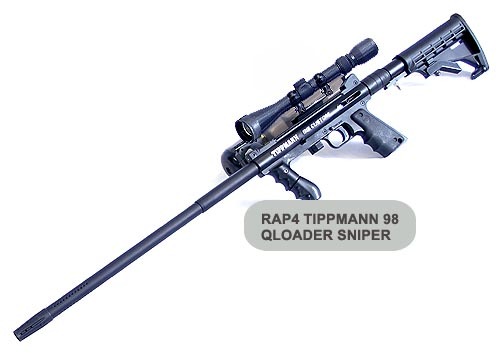 The Tippmann 98 sniper rifle’s barrel is an 18 inch tactical rifled barrel; great length and rifling adds to distance and straightness of shot. 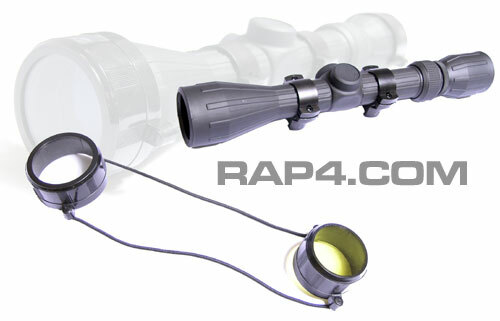 The 3-9x40 sniper scope is excellent for dialing in targets for the longest range of the marker; this scope is also powerful enough to use it for reconaissance missions. The adjustable carbine buttstock on the Tippmann 98 sniper is great for stabilizing your marker against the shoulder for steadier aiming. Another advantage to owning a Tippmann 98 Sniper paintball gun is the fact that it's made on the 98 Custom marker. The Tippmann 98 Custom is extremely reliable, easy to maintain and fun to use; it's also one of the most customizable paintball guns in the industry. It has a 1 year warranty backed by Tippmann. One of the best things about the Tippmann 98 Sniper is how affordable it is! Under $300, we are glad to bring such power and precision to your game for such a bargain. Buy this marker from ChoicePaintballGuns and get Free Shipping! *This package does not come with a Q Loader kit as shown in the picture.